Sure Alan, it's just "hilarious". I'm waiting for you to pull out your "counterfeit coin". Doubt really is your product, isn't? 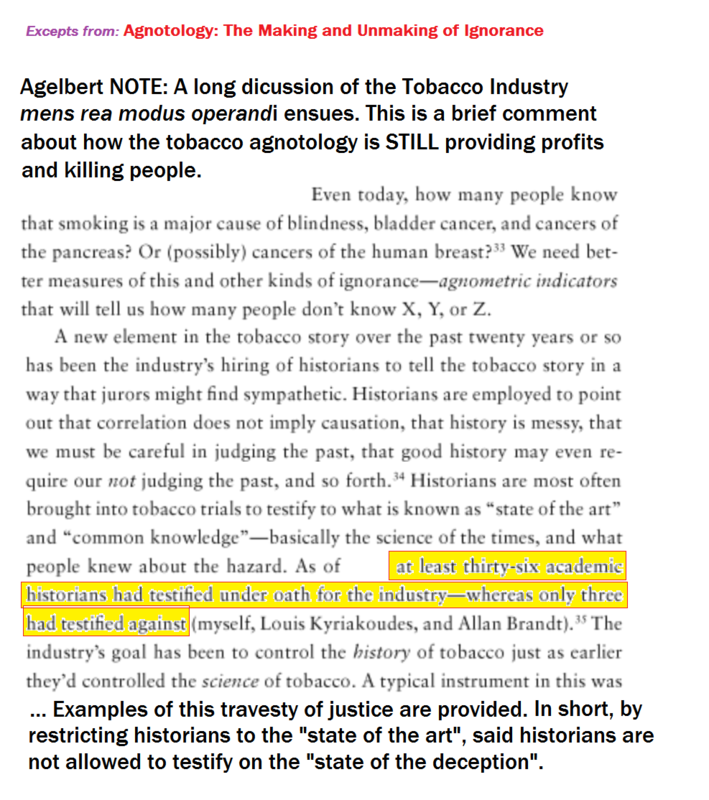 The above book, though not part of the book below, is relevant because it details the use of the SAME unethical strategy pioneered by the Tobacco bastards that HAS BEEN, AND CONTINUES TO BE, USED by the dirty energy producers for the last 40 years. I am amazed you don't know what biosphere math is. The short version is that the biosphere operates in a band of temperature, pressure, pH and a trophic (stuff we are nourished by) web of species interconnections. All species have slightly varying requirements, but the bottom line is that they must remain within a "goldilocks" type band to survive extinction. The stability of the composition of those bands constitutes a plus in biosphere math. The instability born of radical departures from those bands constitutes a negative in biosphere math. For example, we require a certain population of gut bacteria in a certain proportion of bacterial species. A slight departure will kill us (e. g. E.coli food poisoning) even though we have a lot of the SAME bacteria that will kill us if it spoils food we are about to eat living happily in our intestines extracting vitamins, minerals and other nutrients from the food. Nature is the same way. You DO NOT have to have this obvious giant threat out there to be in danger of extinction. The biosphere is EXTREMELY fine tuned. Our activities are guaranteeing an unquestionable forced departure from the life giving band of hundreds of thousands of species, including our own. But I have not been able to communicate to you how truly fragile our existence is. It's a bit ironic, because I'm not going to be here to see the really massive human die offs starting around 2050. But Ashvin will. and if you are young, so will you. All that said, I do appreciate the fact the you believe I am sincere, and not out to propagandize people for the jollies of scaremongering. Perhaps after I'm dead, God (or is it the "goddess" to you? ) will task me to sing "Henry the Eighth" (see the movie "Ghost) to Ashvin when the Greenland ice sheet slides into the ocean and the oceans jump 20 feet or so within a few months. That is, right after he starts asking "Who coulda node? ".